Is TankVac® easy to install? Clean water – How important is it to you? Harvesting and storing rainwater is a simple and efficient way to provide a safe, natural water supply. Being a free resource, it also makes great financial and environmental sense. But you also need to ensure the rainwater you store in your water tank remains clean, fresh and safe. In the past this has meant either paying a professional or attempting the difficult task of cleaning it yourself. Until now… Introducing the permanent, hassle-free alternative – TankVac®! Why do you need TankVac®? Maintaining the quality of your stored rainwater is a never-ending challenge. Even with a leaf gutter catcher, plant material, waste and sediment still accumulate at the bottom of the tank, creating a layer of sludge – a breeding ground for harmful bacteria including E.coli, Giardia and Salmonella! These bacteria are dangerous to your family’s well-being. They can cause vomiting, stomach cramps, diarrhoea and other serious health issues. 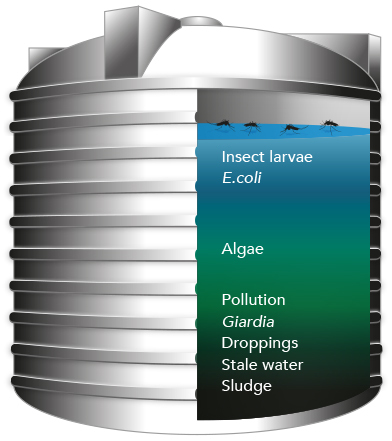 If these microbes live in your water tank, you can attempt to filter them out at the tap. However, only the microbes’ outer membranes are collected – the rest of the harmful bacteria will still flow through into your body! No smells, no harmful bacteria – just fresh, sparkling rainwater! © 2014 TankVac®. All Rights Reserved.